The Sennheiser XSW 1-Cl1 Wireless Instrument System is a user-friendly all-in-one wireless set that is perfect for guitars and other instruments with a 1/4'' jack. The Sennheiser XSW system delivers quick and easy set up thanks to the automatic frequency search and synchronisation via RF remote channel while professional True Diversity technology ensures flawless signal transmission. 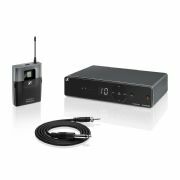 Featuring an unbalanced 1/4'' jack and a balanced XLR audio output, the XSW 1-Cl1 wireless system is ideal for a range of live performance venues.